Canoe and Kayak Rentals with access point and campsite delivery services. Free delivery to Canoe Lake & Smoke Lake. Single and double burner stoves, cooking kits, folding saws and tarps are.all available for rent. Coupons, School Group Discounts, Special Offers, Online Deals and Seasonal Offers, Military Discounts. Delivered by our experienced Algonquin Park guides, Our introductory course in canoeing and interior camping is best suited for those who have no experience with canoe tripping. Enjoy a hassle free Algonquin Park trip and let us deliver your canoe or kayak access point of choice. Let the experts at Algonquin Biund deliver your Canoe or Kayak straight to your Algonquin Park campsite! Ideal for those planning a one way Algonquin Park canoe route. No destination is too far! We will pick you up from the nearest bus station and bring you to our outdoor stores to gear up. No matter the season, Algonquin Park offers ample opportunities for outdoor activities. In the summer sunshine head out on the thousands of kilometers of trails, or canoe the great waterways, and then pitch your tent in one of the numerous campsites for a snooze under the stars. For those looking to view some of Algonquin Park’s incredible wildlife, take your adventure into the fall where the forest is alive with colour as you hike and paddle your way through one of the most surreal natural surroundings in Canada. Then finally, bound into new adventures in the spring, fishing the thousands of lakes and rivers. There’s never a ‘key’ season to head to Algonquin Park, because adventure is alive all year long! Best Time to visit: Late April to Mid-May. Algonquin Park comes alive in spring. Along with the newly formed tree buds and renewed animal activity comes an influx of canoe trippers starved to get a paddle in the water after a long winter slumber. The main attraction of the park in spring is the good fishing for lake and brook trout. Anglers from around the world flock to the park in search of that once in a lifetime Algonquin Park trout. 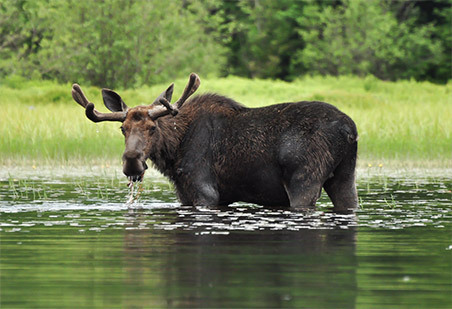 This is also a good time for wildlife viewing, with moose more commonly spotted at this time. The best time to visit is late April to late May. Those looking for better weather and warmer nights often wait until July to visit the park. At this time, canoe camping, fishing, hiking and swimming and are the most popular pursuits. Mid-July to late August is the high season for Algonquin Park canoe tripping, but the park is well managed to ensure there is a campsite for everyone. Algonquin Bound services several quieter access points, like Shall Lake, which makes it all that much easier to find a scenic and peaceful campsite away from the crowds. Fall is a special time in Algonquin Park. The fall colours display is world renowned and is simply something that must be experienced. 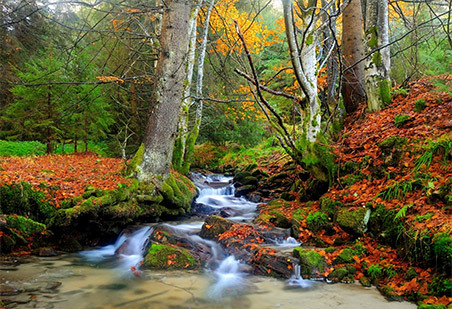 Starting in late September, the deciduous forests turn from green to a vibrant array of yellow, red and orange. Although Farm and Crotch Lakes are popular destinations, there is no better a place to revel in this display than taking a weekend trip into Booth Lake. The rolling hills come alive with an amazing display of colour. Oh yah, the fishing is pretty good then too! 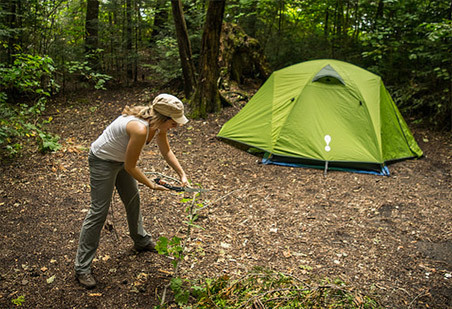 Our full service Algonquin Bound stores provide all the canoe, camping and fishing equipment you will need to explore Algonquin Provincial Park. With competitive rates and knowledgeable staff, we can plan your trip from a one day excursion to a full multi day adventure.